May 7, 2016 (Tony Cartalucci - NEO) - How the United States presumes to possess the authority to determine the fate of a sovereign nation thousands of miles from its own shores in the Middle East is never explained by US Secretary of State John Kerry when he recently announced a new ultimatum leveled at Damascus. Nor is it explained why Syria should capitulate to US demands to begin a political transition that has demonstrably left other nations across the Middle East and North Africa (MENA) divided, destroyed, and safe-havens for state-sponsored terrorism years after "successful" US-backed regime change has been achieved - Libya most notably. Image: Sirte, Libya, post NATO-intervention. 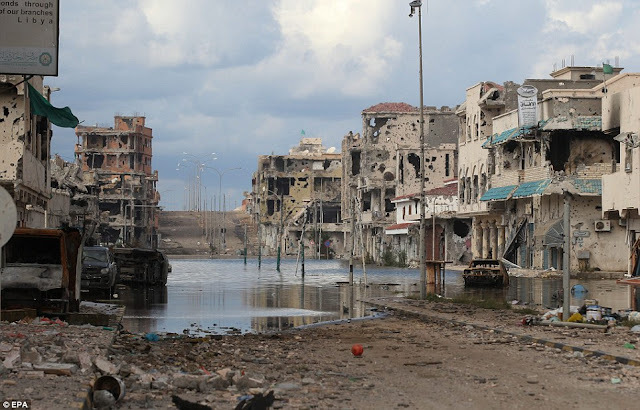 This is the final result of US-backed, NATO-enforced regime change. The city now serves as a base of operations of the notorious Islamic State terrorist organization, with the rest of the nation divided and destroyed years after US "success" there. 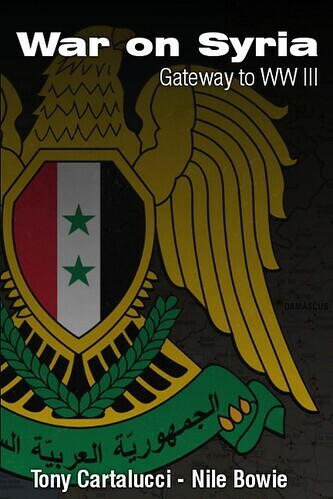 Now the US demands Syria follow suit. Yet despite all of this, according to the Associate Press (AP) in their article, "Kerry warns Assad to start transition by Aug. 1 or else," the United States fully expects Damascus to concede to a "political transition" engineered by Washington, leaving the nation in the hands of verified terrorists linked directly to the political and militant forces currently laying waste to Libya and those nations that put them into power. Secretary of State John Kerry warned Syria's government and its backers in Moscow and Tehran on Tuesday that they face an August deadline for starting a political transition to move President Bashar Assad out, or they risk the consequences of a new U.S. approach toward ending the 5-year-old civil war. ...it's unlikely that the Obama administration, so long opposed to an active American combat role in Syria, would significantly boost its presence beyond the 300 special forces it has authorized thus far in the heart of a U.S. presidential election season. More feasible might be U.S. allies like Saudi Arabia giving the rebels new weapons to fight Assad, such as portable surface-to-air missiles. Again, the US is making demands of "Syria's government and its backers in Moscow" while it is openly allied with Saudi Arabia who is admittedly backing US State Department-listed foreign terrorist organizations including the Al Nusra Front - quite literally Al Qaeda in Syria and Iraq. Image: The US and its closest allies are literally arming and funding Al Qaeda in Syria, and fully expect the nation and its people to capitulate to a proxy government dominated by them. Despite superficial attempts to portray Al Nusra at "arms length" from Saudi Arabia, and thus from Saudi Arabia's closest and most valuable ally, Washington, the inseparable nature of those the US and Saudi Arabia are supporting and those they claim not to support is documented fact. 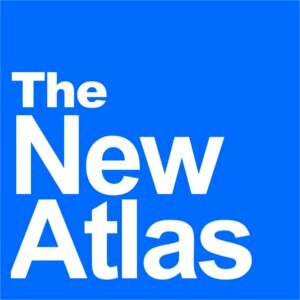 Considering the verified nature of the so-called "opposition" in Syria and the verifiable nature of what US foreign policy has done to Libya - leaving it to this day in the hands of state-sponsored terrorist organizations including the notorious "Islamic State" or ISIS - what the US is essentially demanding of Syria and its allies is capitulation to Al Qaeda. 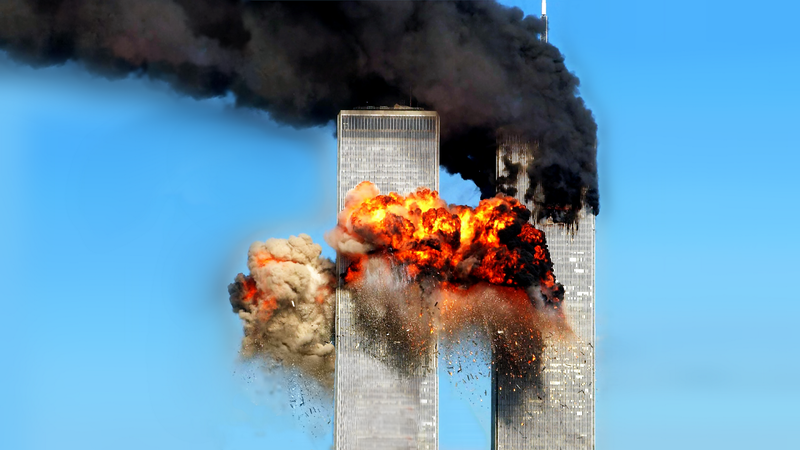 It is a surreal full-circle US foreign policy has made, from first creating Al Qaeda in the late 1980's jointly with Saudi Arabia and elements within the Pakistani government, then claiming to have been struck egregiously by the terrorist organization on September 11, 2001 triggering over a decade of very profitable war, before finally arriving in Libya and Syria beginning in 2011 where once again US politicians found themselves standing shoulder-to-shoulder with literal commanders of Al Qaeda and its affiliates, waging proxies wars against their collective enemies. Image: US Congressmen posing with an Al Qaeda commander in Libya, after NATO destroyed the nation and handed it over to verified terrorists in 2011. 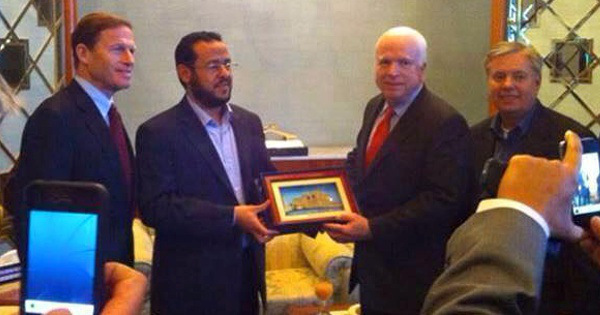 Indeed, US Senator John McCain would find himself in a Libya utterly devastated by NATO at the end of 2011, shaking hands with the commander of US State Department-listed foreign terrorist organization, the Libyan Islamic Fighting Group (LIFG) - literally Al Qaeda in Libya. The LIFG commander, Abdelhakim Belhadj, had at one point been arrested by the US before being handed over to the Libyan government and imprisoned for his terrorism. 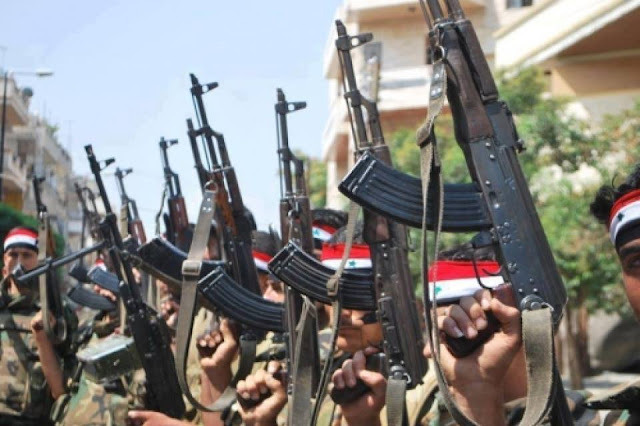 Syria is undoubtedly being overrun by heavily armed and extremely dangerous terrorists backed by foreign powers. 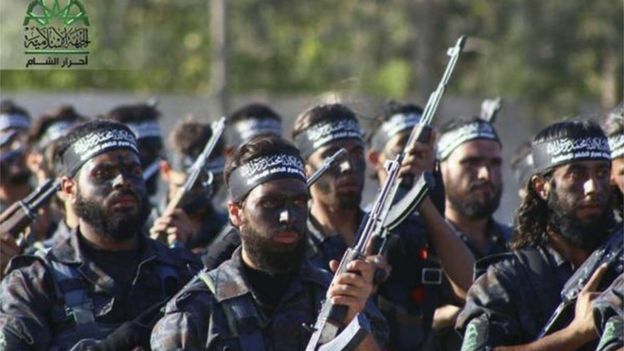 These are terrorists that have proven already in Libya, that upon coming to power, they will first carry out genocide against their ethnic and political enemies, then transform Syria into a devastated wasteland and springboard for terrorism and proxy war elsewhere in the region - likely Iran and then southern Russia. Syria's only clear course of action is to resist and defeat these terrorist factions and restore order within the nation's boundaries. It must do this by interdicting terrorists and their supplies along the Turkish-Syrian border in the north, and the Jordanian-Syrian border in the south. It is abundantly clear that the terrorists operating within Syria cannot sustain their fighting capacity without significant and constant logistical support from their foreign sponsors beyond Syria's borders. This fact alone, undermines the legitimacy of the so-called "uprising" and "civil war" in Syria that upon closer examination is clearly a proxy invasion. The US has already boasted of having struck hard at the leadership of various terrorist groups in Syria it claims to be at war with, yet these groups appear unfazed. This is precisely because the terrorism is being direct externally, from Turkey and Jordan where the US itself has based its forces for its ongoing Syrian operations. The clear and obvious course of action for the US is to identify the "roots" of this externally directed terrorism and "sever" them. US Secretary of State John Kerry threatens a "new approach" by the US in Syria, if Syria does not capitulate to what is essentially the end of its existence as a functioning nation-state. The "new approach" is likely simply the continuation of existing plans to incrementally invade and occupy Syrian territory, particularly in the east through the infiltration of Iraq-based Kurds operating under US proxy Masoud Barzani, as well as to trigger a cross-border incident north of Aleppo by using their ISIS proxies to attack Turkish targets - reminisced of staged attacks Ankara had planned earlier during the war to justify the invasion and occupation of northern Syria. Warning the world of the "success" America's previous "political transitions" have wrought in Libya or Iraq, and raising awareness of the current nature of US-Saudi support for Al Qaeda and other terrorist groups in Syria today, is essential in undermining the legitimacy and authority upon which the US is attempting to base its demands directed at Damascus. The demands are illegitimate and the authority they are made with constitutes not principles nor rule of law, but naked and unjust aggression that must be resisted today lest it succeed and set a precedent for further acts of injustice against other nations tomorrow.